Where every day in the kitchen is an adventure! Chinese New Year is coming and I am really looking forward to it! Unfortunately I no longer receive red envelopes containing money as I did as a child in Hong Kong, but I enjoy any chance to celebrate festivities! 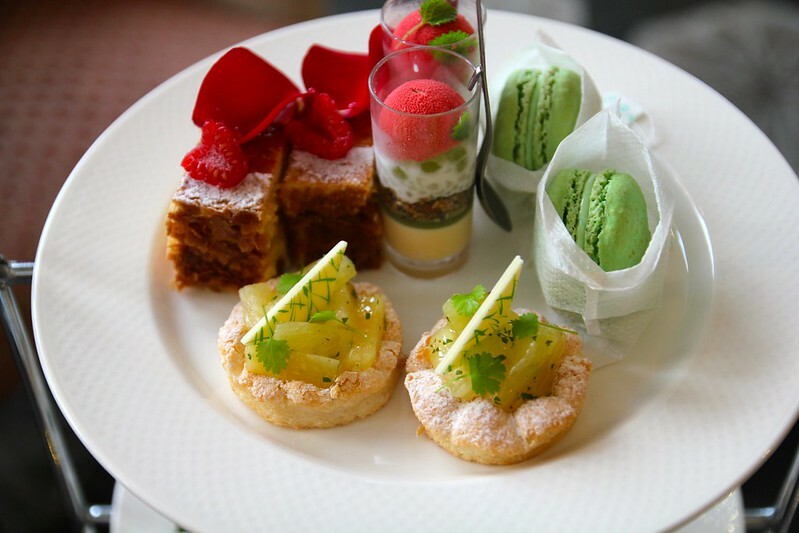 You can imagine my excitement when hearing that a Chinese New Year themed high tea created by the lovely and extremely talented pastry chef Anna Polyviou would be featuring at Shangri La in Sydney this year. Asian themed sweets in high tea? I’m sold! I absolutely adore stocking up on Asian sweets at my local Asian grocery as well as going a little nuts in Chinatown’s amazing Chinese bakeries. I’ve grown up on scoffing red bean treats, custard tarts and moon cakes ever since I can remember and was really excited to see what sort of Asian twist Anna would put on the CNY high tea and I was not disappointed! To be honest at first glance I wasn’t sure how best to eat this. Cram it all in my mouth and endure the pleasure/pain of consuming it all in one go? Or attempt to cut in half (but shattering the delicate pastry and making what I assumed would be a rather messy affair?) Well, I ended up eating it layer by layer, which I can assure you wasn’t really the cleanest method, but it sure did get the job done. How to describe this dessert? It was simply divine – the freshness of the lychee in the rich custard paired with the lemongrass and rose creme patissiere, just… wow. 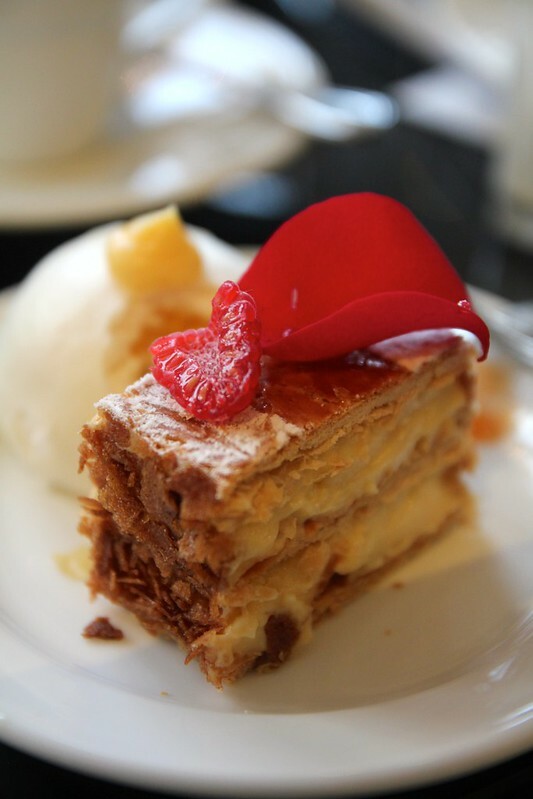 It’s a fairly well known fact that rose and lychee are basically a killer combination, but to combine it in a millefeuille with the crisp, shattery pastry and a rich creme patissiere was a mindblowingly good combination. I enjoyed every single bite. I was really looking forward to this little dessert, given that I absolutely adore coriander, I was really interested to see how it would turn out in a sweeter setting. To be honest for some reason I didn’t think it would be my favourite of the night, but it surprisingly was. 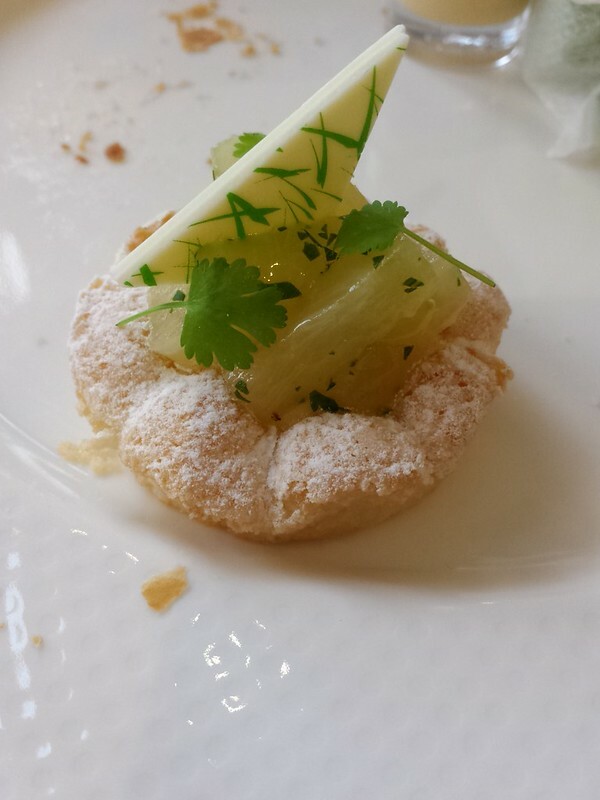 The soft, coconutty dacquoise melted in your mouth and blended with that sweet but tart lemon curd and topped off with the zing from the pineapple, ginger, coriander…. Just wow. It all just worked and you could really taste all the flavours working together so well. It was a heavenly combination and I definitely could have devoured more of these little beauties! Genius idea pairing all those incredible flavours together and I also really loved the cute little white chocolate triangle with what appeared to be green grass painted on – such beautiful presentation. This was another stunning dessert – and again showcases Anna’s fabulous skills at matching a whole bunch of flavours together and just making them work. Here we had sesame, red bean, coconut and kaffir lime – very Asian flavours that you don’t generally see together, especially when matched with additional ingredients such as caramelised chocolate, apple and lime jelly and apple popping pearls. At first glance, one might think that these sorts of things wouldn’t go together very well – but Anna whips out this little number and you are again left pretty much left sitting there going ‘I don’t know how this works, but it does…and I want more.’ Try and get a spoonful of each ingredient to get the maximum hit of flavour from this dessert. Definitely one that leaves you wanting more! This one really made me think how much care and attention to detail each dessert had – I just imagined them mixing up a batch of each careful layer. 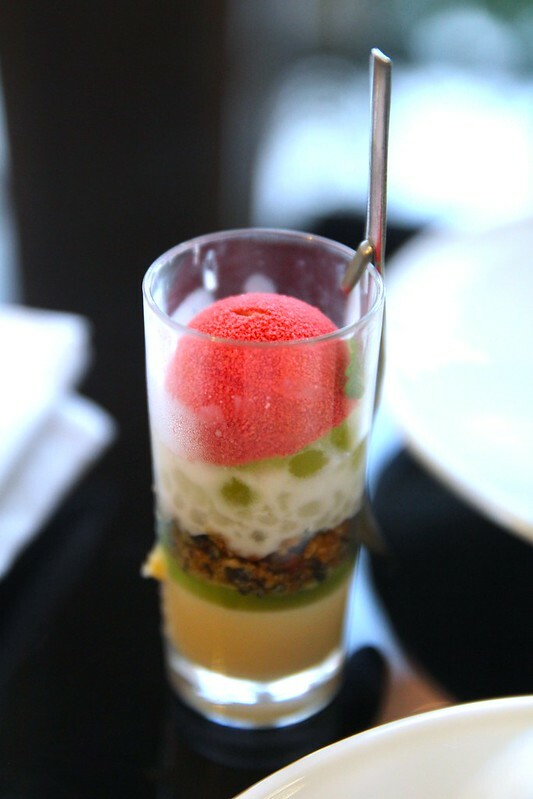 So much work put into such a small and beautiful dessert I think really shows passion for one’s work! 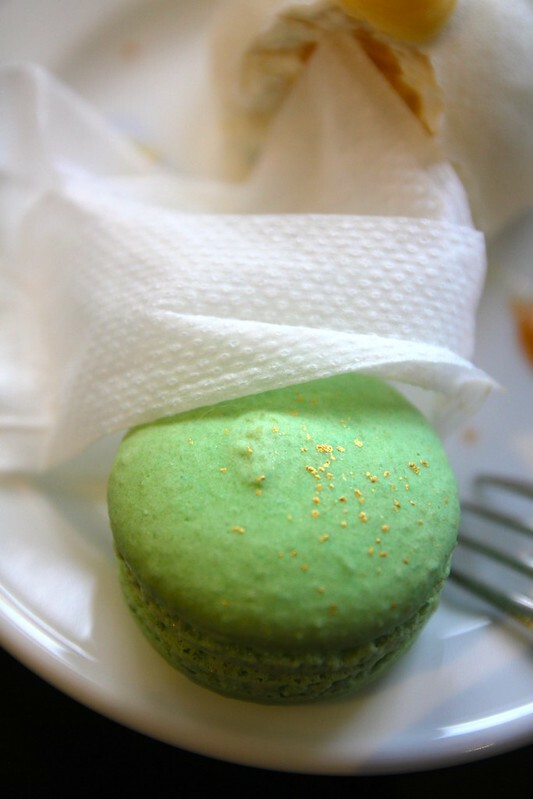 These macarons were sooo pretty with the vivid green matcha shells with the delicate gold spotting to the beautifully shiny pandan buttercream filling. I also loved how they were served in cute little teabags! Unfortunately I couldn’t taste the matcha very much in the shells, but found the toasted pandan buttercream flavour shone through the most and it was very enjoyable. These crepes were a nice change from the usual yum cha mango pancakes and we loved the rice pudding interior with fresh cubes of mango throughout. 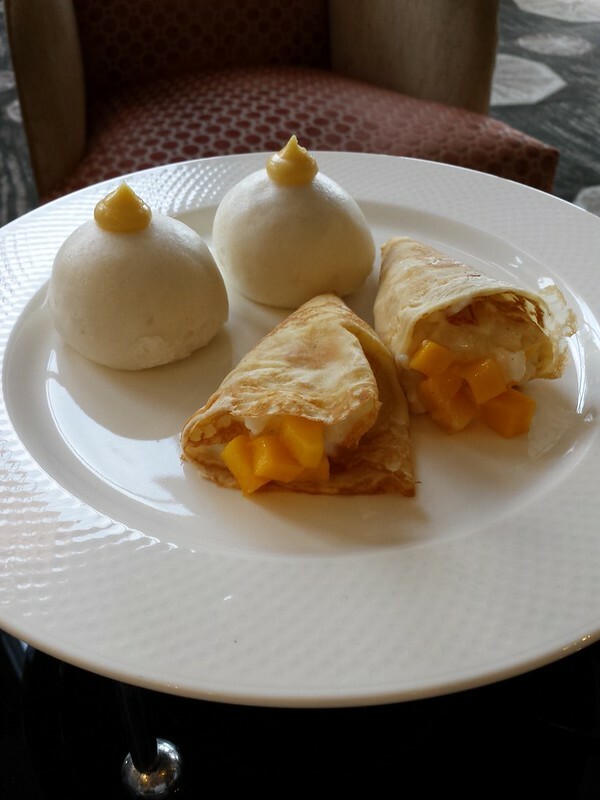 The crepes were soft and lacy, the rice was soft and gave the dessert a nice texture, especially with the soft juicy bursts of sweetness from the mango. 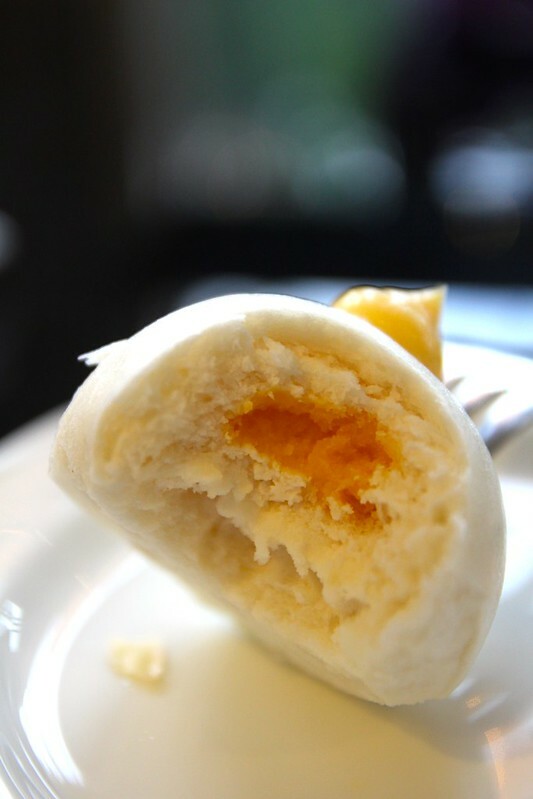 These custard buns are similar to the steamed type you might find at yum cha or a Chinese bakery with the custard baked inside and a soft doughy exterior. My husband really enjoyed these and remarked they were ‘fun to eat’ (I suspect because he was able to just pick this one up with his hands and go for gold). The barramundi spring rolls encased a very tasty fish and vegetable filling and had a super flaky pastry exterior. These went wonderfully well when dipped in the house made sweet chilli sauce which was just the right amount of sweet and chilli (and didn’t taste like the candy sweet bottled version). My husband reported that the prawn and vegetable dumplings had a soft exterior with a hot and tasty filling (but mentioned that he preferred dumplings from our usual yum cha haunts). Mike also reported that the pork ears were seasoned perfectly and didn’t need to be dipped into the sauce, but were amazing when paired with the fresh salad it rested on. They were definitely very crispy too – I heard every crunch! “I love these buns,” he exclaimed when reaching for the pork belly bun and this one did not disappoint. The pork belly was super soft and well matched with the crunchy coleslaw and super soft buns. I absolutely loved this Asian twist on the traditional high tea and would definitely do this experience again! 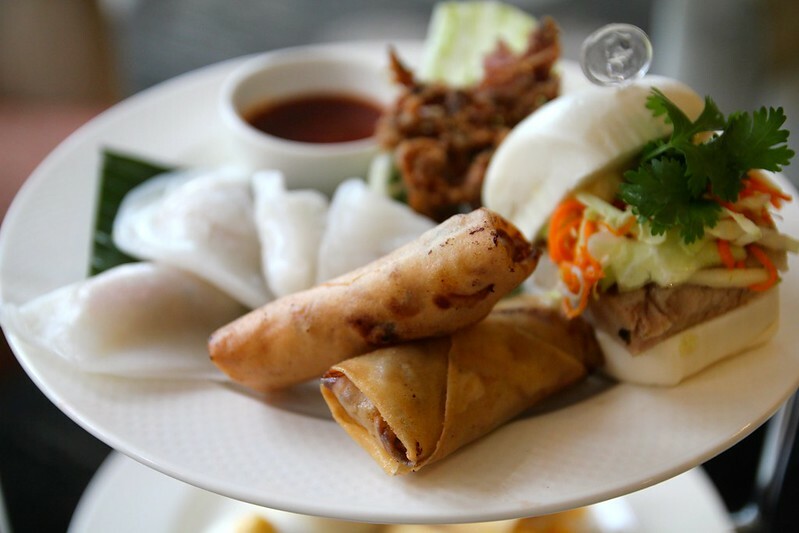 Yum cha and high tea are basically two of my most favourite things, so for me it doesn’t get much better than this! (I must have a love affair with eating snacks and drinking tea!) If you have a guy-friend in your life that shies away from pretty, ladylike high teas, I would highly recommend taking him along to this as it’s definitely a bit less ‘daunting’ or rather, girly I’d say (so no loss of masculinity points, men!) I was seriously impressed with the Shangri-La’s research, attention to detail and of course results into this version of high tea and it honestly was so much more than I was expecting. Anna and her fabulous pastry team have done it again! Check this one out before it’s gone on the 3rd of Feb! Only running for a short time, so get in quick! Not many savoury options for vegetarians (but I would encourage you to give them a call and ask as I expect they would cater to this). 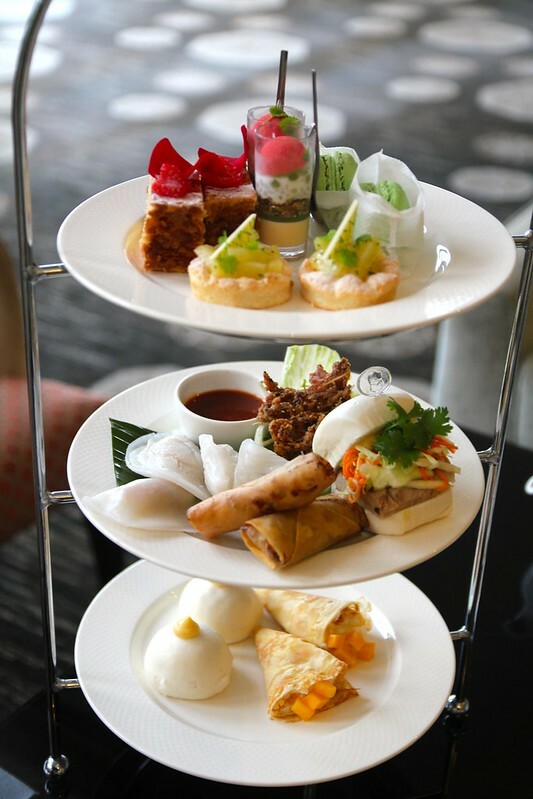 The Chinese New Year high tea is available from 25 January through to 2 Feb and costs $42. 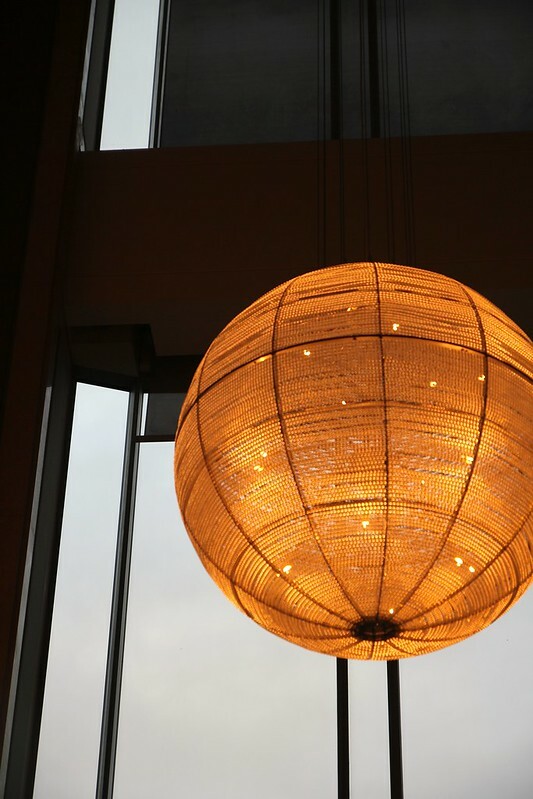 To check out more info (including on how to book), check out this link from the Shangri-La website here. Cooking Crusade dined as a guest of the Shangri La, but the opinions in this post are my own. Wanna keep in touch? Why not like me on Facebook or follow me on Twitter or Instagram. Adventures in the kitchen ! I think the sticky rice and mango would be my pick – yum! Crispy pigs ears sounds like my kinda afternoon tea! And the millefeuille looks incredible! No wonder those are so puffy and soft! rose creme patissiere is my favorite too! 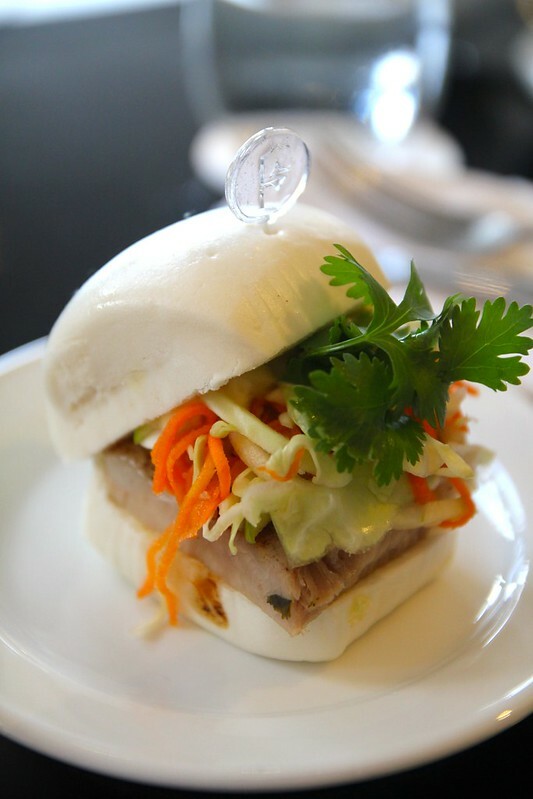 Yuuuuuuuum, that pork belly bun……WINNING! My wife was just talking about picking up some pigs ears……..as you do 🙂 What a fun spin on high tea and a nice mix, but a little more savoury would make me a happy chappy. Looks great though! Now that is my kind of high tea. What a lovely and elegant high tea! Such a shame I don’t live in Sydney. I didn’t even know there’s high tea for CNY and this one has some delicious look savouries, especially the pork belly bun. Wow, amazing flavours! 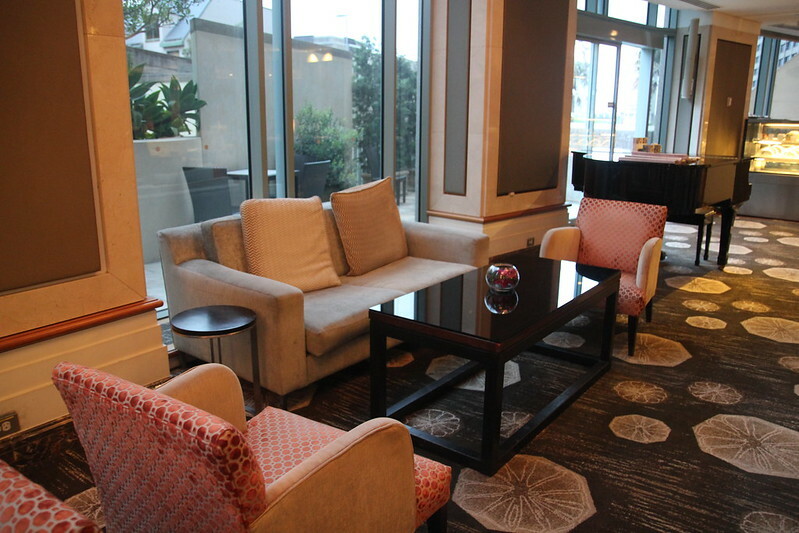 Looks fantastic and a pretty good price for a high tea too! Hi! I'm Christine - I'm a Sydney based chef student by day & food blogger by night. I love learning about food every single day and share my adventures with you here. Thanks for reading! You can contact me on christine@cookingcrusade.com - I'd love to hear from you!